CYPRESS, Calif. – The legendary Concorde no longer takes to the skies with a thundering roar but the supersonic jet – which flew 60,000 feet above the Earth at twice the speed of sound  lives on in a specially constructed hangar at Aerospace Bristol (England) complete with a vivid projection mapping display thanks to Christie® and Projection Artworks. 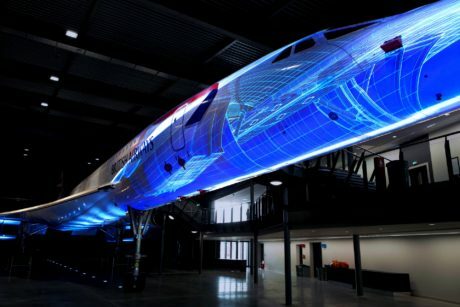 Using Alpha Foxtrot – the last Concorde ever built  for the backdrop, Projection Artworks selected four Christie D13WU-HS 1DLP® laser projectors for a unique storytelling projection mapping canvas. Using custom content that fuses iconic footage with exclusive interviews and graphical effects mapped on the right-hand side of the front fuselage, visitors embark on a 12-minute journey through the Concorde’s storied past from its design to the technical intricacies of the engine. Celebrities who flew on the Concorde are part of the visual voyage as are flight paths and x-ray images, while the audio track features commentary from engineers, pilots and stewards who worked aboard the vessel. 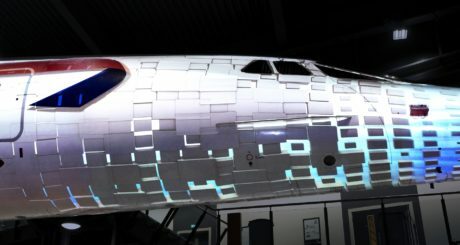 Using a laser scanner to take accurate measurements at three million points on the aircraft, Projection Artworks completed 50 scans and created a 3D model. They then combined all the points to form one three-dimensional point cloud, resulting in an accurate model. “After installing Christie laser projectors in previous installations, we knew they would provide the right balance in terms of chassis size with all the control capabilities we needed,” said Jackson Taylor, head of technology, Projection Artworks. Over 150,000 visitors went through the doors within the first ten months of the attraction opening and the exhibit continues to earn five-star reviews on several travel websites and social media. “I was really proud of this project. When you work on it, you almost have these blinkers on; it’s hard to stand up and appreciate it. When we watched it through for the first time we knew it was a job well done and the reaction you see makes it a lot better,” MacArthur concluded.